Bagels on a weekend morning are a time-honored tradition for many. Take the meal up a notch by adding some homemade cured fish to the spread. Bagels on a weekend morning are a time-honored tradition for many. Take the meal up a notch by adding some homemade cured fish to the spread. And if you really want to go all the way and have a totally from-scratch bagel experience, try making your own bagels. Here, six terrific cured fish recipes that would all be amazing on a bagel. Cold-smoking is not an option for most home cooks. 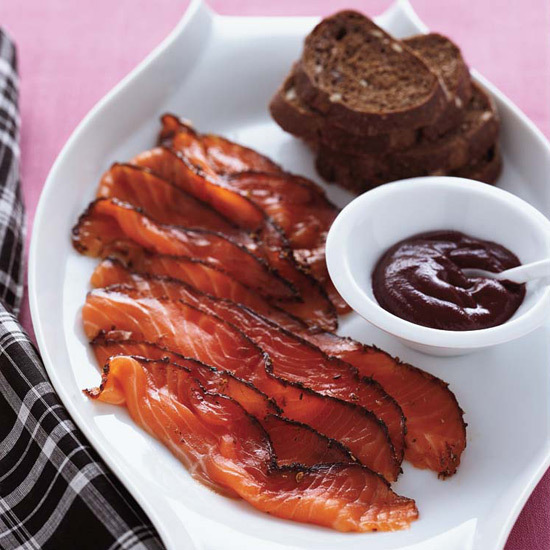 Instead, this recipe calls for quickly smoking the fish, then curing it like gravlax. Grappa’s slight earthiness and high alcohol make it perfect for curing fish. Andrew Zimmern’s stellar gravlax is cured with salt, sugar, dill, parsley, red pepper, lemon zest and aquavit. This salmon is delicious savory, but it’s also slightly sweet from the raw sugar in the cure and the molasses in the glaze. Grilling trout with indirect heat gives it a fantastic smoky flavor. Instead of smoking salmon, chef Alex Stupak ingeniously adds smokiness with chipotles and mezcal.